The 528-page conclusion to the foxiest manga series ever! For fans of Inukami! comes an all-new harem comedy manga about a teenage boy and his romantic misadventures with a feisty fox girl and a wily wolf girl! Kanokon orginated as an award-winning light novel series in Japan and was then adapted into a popular anime and manga series. 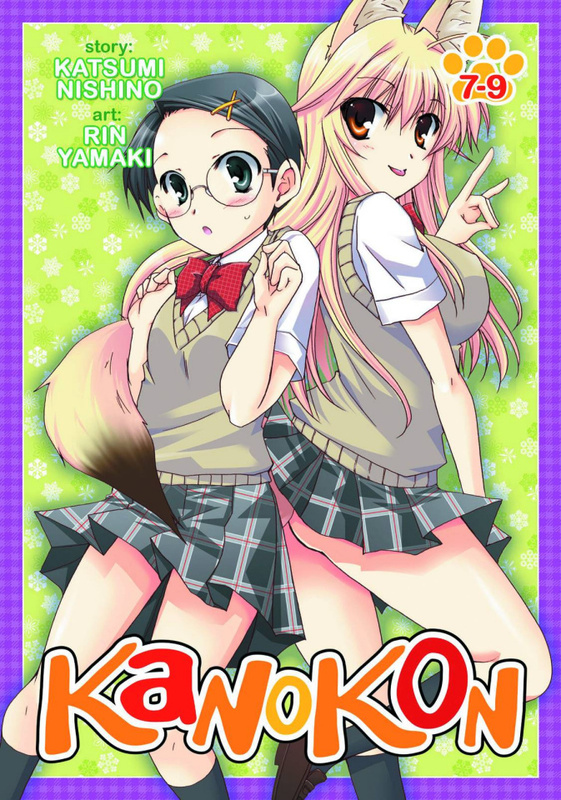 This omnibus edition contains volumes 7-9 of the Kanokon manga series, published for the first time in North America! Innocent country boy Oyamada Kouta transfers to a big city high school in his freshman year, and from day one, his life enters a world of crazy. First, a beautiful second-year student named Chizuru professes her love to him, then reveals that she is in fact a fox spirit. Frisky and flirty, she suggestively teases naive Kouta in front of his classmates, embarrassing him to no end. If that wasn't enough, a gorgeous wolf spirit named Nozomu suddenly transfers to Kouta's class and decides she wants the hapless country boy for herself. As fox girl and wolf girl vie for his heart, does Kouta have any say in this?